Like testacea, foraminifera possess a shell. This can be monothalamous (single-chambered) or polythalamous (multi-chambered). The shell is made of organic material which incorporates chalk, grains of sand or other things. The chambers are built successively and are connected to both, the following chamber as well as to the extracellular space. Reticulopods are predominant and can extend from the terminal aperture or from the pores in each chamber. 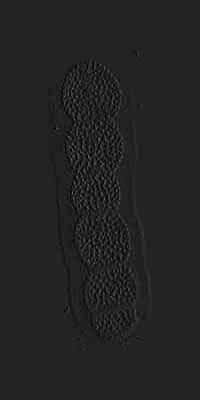 "Granular streaming", the intracllular movement of vesicles, mitochondria or other cellular components along the pseudopods, which contain bundles of microtubules, can be frequently observed. Propagation can be sexual or asexual, in some species also heterogony has been observed. Foraminifera are facultatively marine and live mostly in coral reefs, on rocky shores or in sandy ground as part of the mesopsammon. Many species contain zooxanthellae. Foraminifera have an important ecological function as main source of marine sediments. This page last updated April 12, 2007.